↑ Buckley, Chris (23 March 2015). "In Lee Kuan Yew, China Saw a Leader to Emulate". The New York Times (blog). Koh, Buck Song (2011). Brand Singapore: How Nation Branding Built Asia's Leading Global City. Singapore: Marshall Cavendish. Lee Kuan Yew website; accessed 22 March 2015. War of Words Alejandro Reyes, Time, 25 September 1998. 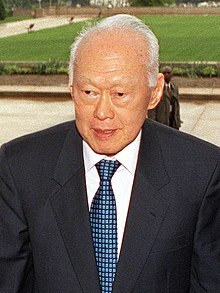 Lee Kuan Yew: A Chronology, 1923–1965 Largely based on Lee Kuan Yew, The Singapore Story: Memoirs of Lee Kuan Yew . Singapore: Times, 1998.